Hydrolyzed gallic acid in Potentilla chinensis Ser. was determined by HPLC using Potentilla chinensis Ser. as a model drug with chromatographic conditions as follows: Hypersil C18 column (250 mm × 4.6 mm, 5 μm); mobile phase methanol-0.05% aqueous solution of phosphoric acid (10:90); volume flow 1.0 mL/min; detection wavelength 271 nm; column temperature 25°C; and injection volume 20 μL. Injection amount of gallic acid was in a good linearity with peak area at a range of 36.080~230.912 ng, average recovery was 99.2%, with a RSD of 1.89%. Free gallic acid could hardly be detected in Potentilla chinensis Ser., while gallic acid amount was relatively high after hydrolysis, suggesting that Potentilla chinensis Ser. contained a certain amount of hydrolysable tannins. In conclusion, the indirect control of tannin residual amount in Potentilla chinensis Ser. can be achieved by determining hydrolyzed gallic acid in Potentilla chinensis Ser. Potentilla chinensis Ser., tannin, hydrolysis product, gallic acid, HPLC. Potentilla chinensis Ser. is a perennial herb in the genus Potentilla of the family Rosaceae. The herb is distributed in most parts of China, which is mainly grown in Anhui, Shandong and Liaoning . Potentilla chinensis Ser. has a light smell and is slightly bitter in taste. The herb possesses astringent, spasmolytic, heat-clearing, detoxifying, blood-cooling and dysentery-checking properties. Due to its vulnerary properties it is used to treat hemorrhoidal bleeding, carbuncles and boils . In folk medicine, the dried whole plant of Potentilla chinensis Ser. is used to treat Type-2 diabetes. According to reports, Potentilla chinensis Ser. mainly contains triterpenoids, flavonoids, phenols, and tannins [3-5], which can prevent muscle spasm, and has hepatoprotective function [6-8]. After preliminary experiments, it was found that Potentilla chinensis Ser. contained relatively high amount of tannins. The estimation of tannin content in Potentilla chinensis Ser. had some significance to the quality inspection of crude drugs, and development of quality standards for medicinal materials, as well as relevant formulations such as injections. With increasing application of Traditional Chinese Medicine (TCM) injections, reports of adverse reactions associated with such dosage form are increasing, and their quality and safety are causing widespread concern in the society [9-10]. It has been reported that tannins are a possible cause of allergy. The presence of tannins affect the stability of particle system in TCM injections, leading to the occurrence of adverse reactions [11-12]; moreover, tannins can also bind with tissue proteins to form induration, causing pain and necrosis at injection sites; once released into the bloodstream, they can also bind with amino groups of plasma proteins as a hapten to become a strong allergen, inducing serious adverse reactions. In this study, a method for HPLC determination of gallic acid after hydrolysis was established making use of a property of tannins, i.e. ability to be hydrolyzed to gallic acid under certain conditions, which achieved the purpose of indirect control of residual tannin in Potentilla chinensis Ser. preparations, providing a new way of thinking for the establishment of highly sensitive, specific method for detection of residual tannin. Agilent 1200 HPLC, Agilent, USA; GYH210 constant temperature water bath (Chengdu Experimental Instrument Co., Ltd.); HD-A-2 low-speed table-top centrifuge (Shanghai Climaveneta Co., Ltd.); 1876-6H pH meter (Nanjing Precision Scientific instrument Co., Ltd.). Gallic acid reference (batch No. 20140513-200451) was purchased from the National Institute for the Control of Pharmaceutical and Biological Products; methanol (HPLC grade), phosphoric acid, hydrochloric acid and sodium hydroxide were all of analytical grade, and double distilled water was used for all preparations. Potentilla chinensis Ser. crude drug was purchased from Tianshiqi TCM Decoction Pieces Plant, which was identified by Tian Guangqi, a researcher of Chengdu Institute of Phytochemistry, as Potentilla chinensis Ser. in the genus Potentilla of the family Rosaceae. Its roots were dried to a constant weight at 70°C, pulverized, and then passed through a 60 mesh sieve. UV-Vis full wavelength scanning of gallic acid reference solution revealed a maximum absorption at 271 nm, so the measuring wavelength was selected to be 271 nm. Hypersil C18 column (250 mm × 4.6 mm, 5 μm); mobile phase: methanol-0.05% aqueous solution of phosphoric acid (10:90); volume flow 1.0 mL/min; detection wavelength 271 nm; column temperature 25°C and injection volume 20 μL. Under the above conditions, the resolution of gallic acid from two adjacent peaks was greater than 1.5. Number of theoretical plates was calculated to be not less than 4,000 based on the gallic acid peak. Chromatogram is shown in Figure 1. Appropriate amount of gallic acid was accurately weighed, placed in a 10 mL volumetric flask, dissolved in mobile phase and diluted to the mark to prepare the reference stock solution. Gallic acid reference stock solution was accurately aspirated, diluted separately with mobile phase to concentrations of 115.456, 57.728, 28.864, 14.432, 7.216, 3.608 and 1.804 μg/mL, and injected into the HPLC, followed by measurement of peak area. Standard curve was plotted with sample amount as the abscissa and peak area as the ordinate, and linear equation was obtained as y＝60091 x-3.153 (r=0.9999), the results showed that the injection amount of gallic acid was in a good linearity with the peak area at a range of 36.080 - 230.912 ng. 5 g of dried Potentilla chinensis Ser. powder was taken, placed in a 100 mL volumetric flask, added with 5 mL of 4 mol/L HCl solution, and hydrolyzed at 100°C for 4 h; after cooling to room temperature, and centrifuging at 3000 r/min, the supernatant was collected, its pH adjusted between 2-3 with 0.5 mol/L NaOH solution, and total volume was determined; 1 mL of the solution was accurately drawn, placed in a 25 mL volumetric flask, diluted with distilled water to the mark, mixed well, then filtered through a 0.45 μm microporous membrane to give the test solution. 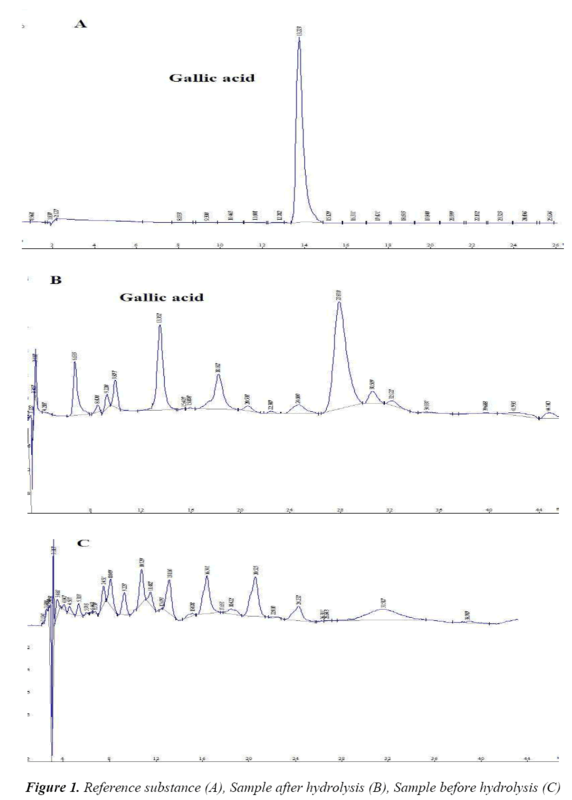 Three mass concentrations, high, medium and low (57.728, 14.432 and 3.608 μg/mL), of reference solutions were taken, and injected continuously for HPLC determination, gallic acid peak areas were recorded, and their RSDs were calculated to be 0.23%, 0.47% and 0.41% (n=5), respectively. Three mass concentrations, high, medium and low, of reference solutions were taken, and injected repeatedly for HPLC determination within 5 d, gallic acid peak areas were recorded, and their RSDs were calculated to be 0.32%, 0.41% and 0.42% (n=5), respectively. Sample with batch number 20140312 was prepared into test solution, and injected for HPLC determination at 0, 1, 2, 4, 6, 8, 12 and 24 h, respectively, at an injection volume of 20 μL, gallic acid peak area was recorded, and its RSD was calculated to be 1.23%. Five aliquots of dried Potentilla chinensis Ser. powders with batch number 20140312 were sampled in parallel, prepared into test solutions, and injected at 20 μL each time, gallic acid peak area were recorded, and RSD of mass fraction was calculated to be 1.31%. Nine aliquots of 2.5 g of dried Potentilla chinensis Ser. powder samples with batch number 20140312 were taken, hydrolyzed, then added with gallic acid reference 80%, 100% and 120% the amount of sample, respectively, with each level having three parallels, to prepare into test solutions, and determined, followed by calculation of recovery. The results revealed an average recovery of 99.2%, with a RSD of 1.89%. Dried Potentilla chinensis Ser. powders with batch numbers 20140312, 20140313 and 20140314 were taken, prepared into test solutions, and injected for HPLC determination at an injection volume of 20 μL, the results are shown in Table 1. Quality and safety of TCM injections is one hot topic in pharmaceutical research in recent years. Existing TCM injections minimize the occurrence of pyrogenic and hemolytic reactions by prescription screening and standardized preparation methods [13-14]. However, there are many other factors which are associated with the safety of TCM injections, for instance, tannin residue is also closely linked to the safety of TCM injections. TCM injections have complex composition, while the existing tannin detection and determination methods have shortcomings of low sensitivity, poor reliability and propensity to false-negative results. Tannins are also known as tannic acid, which can be divided into hydrolysable, condensed and complex tannins in terms of chemical structure and properties. Hydrolysable tannins can produce gallic acid after hydrolysis. In this study, such property of tannins is made use of to investigate the hydrolysis conditions of hydrolysable tannins in Potentilla chinensis Ser. taking crude drug of Potentilla chinensis Ser. as the study object, the amount of gallic acid produced after hydrolysis of tannins in Potentilla chinensis Ser. is determined by HPLC, which achieved the purpose of indirect control of tannin residual amount in Potentilla chinensis Ser. preparations, providing a new way of thinking for the establishment of highly sensitive, specific method for detection of tannins. Free gallic acid can hardly be detected in crude drug of Potentilla chinensis Ser., while the amount of hydrolysed gallic acid is relatively high, suggesting that Potentilla chinensis Ser. crude drug contains a certain amount of combined hydrolysable tannins. After hydrolysis, gallic acid content in Potentilla chinensis Ser. crude drug is determined, which is of great significance to its quality control, providing an important basis for the establishment of its quality standards, and an inspection basis for safety and stability of relevant future injections and other dosage forms. Mesicek J, Sojak J. Annotated Chromosome-numbers of Selected Asiatic Potentilla Species. Folia Geobotanica & Phytotaxonomica 1993; 28: 437-446. Chinese Pharmacopoeia Commission. Pharmacopoeia of the People's Republic of China. Vol. I. Beijing: Chemical Industry Press 2010; 199-199. Shen Y, Wang QH, Lin HW, Shu W, Zhou JB, Li ZY. Study on chemical constituents of Potentilla chinensisSer. Zhong Yao Cai 2006; 29: 237-239. Xue HJ, Yang XK. Common volatiles are major attractants for neonate larvae of the specialist flea beetle Altica koreana (Coleoptera: Chrysomelidae). Naturwissenschaften 2008; 95: 639-645. Wang QH, Li ZY, Shen Y, Lin HW, Shu W, Zhou JB. Studies on triterpenoids from Potentilla chinensis. Zhongguo Zhong Yao Za Zhi 2006; 31: 1434-1436. Jung CH, Choi JK, Yang Y, Koh HJ, Heo P, Yoon KJ, Kim S, Park WS, Shing HJ, Kweon DH. A botulinum neurotoxin-like function of Potentilla chinensis extract that inhibits neuronal SNARE complex formation, membrane fusion, neuroexocytosis, and muscle contraction. Pharmaceutical Biology (Formerly International Journal of Pharmacognosy) 2012; 50: 1157-1167. Lin X, Zhang S, Huang R, Tan S, Liang S, Wu X, Zhuo L, Huang Q. Protective effect of tormentic acid from Potentilla chinensis against lipopolysaccharide/Dgalactosamine induced fulminant hepatic failure in mice. Int Immunopharmacol 2014; 19: 365-372. Wei J, Huang Q, Huang R, Chen Y, Lv S, Wei L, Liang C, Liang S, Zhuo L, Lin X. Asiatic acid from Potentilla chinensis attenuate ethanol-induced hepatic injury via suppression of oxidative stress and Kupffer cell activation. Biol Pharm Bull 2013; 36: 1980-1989. Sun SG, Li ZF, Xie YM, Liu J, Lu Y, Song YF, Han YH, Liu LD, Peng TT. Analysis of rational clinical uses of traditional Chinese medicine injections and factors influencing adverse drug reactions. Zhongguo Zhong Yao Za Zhi 2013; 38: 2969-2973. Zhang XL, Li M, Rong P, Ma R. Analysis and countermeasures of adverse drug reactions of traditional Chinese medicine injections in children. Zhongguo Zhong Yao Za Zhi 2012; 37: 2807-2809. Abed M, Herrmann T, Alzoubi K, Pakladok T, Lang F. Tannic acid induced suicidal erythrocyte death. Cell Physiol Biochem 2013; 32:1106-1116. Karal'nik BV, Tsarevskiĭ IZ. Role of cell-surface protein screening and the determinant of the other sensitin in polyvalent sensitization of tannin-treated erythrocytes. Mikrobiol Epidemiol Immunobiol 1982; 7: 46-50. Guo Q, Wu XY, Shi QS, Huang Q. Research ideas, methods and suggestions on quality evaluation of TCM injections. Drug Evaluation Research 2010; 33: 351- 360. Li LX, Li SF. Causes of adverse reactions with TCM injections and preventive measures. Chinese Traditional and Herbal Drugs 2009; 40: Attachments 4-6.